Cabinets are the defining characteristic of a kitchen. They will likely be the most visible part of the room, and they represent the largest single investment in a new kitchen. So choose your cabinet style and construction features carefully, and plan your kitchen layout to make good use of your available space. A group of 25 kitchen cabinet and bathroom vanity makers say China is destroying their businesses. By Kenneth Rapoza, Contributor. Forbes. Friday, 29 Mar 2019 15:47:00 +0000. 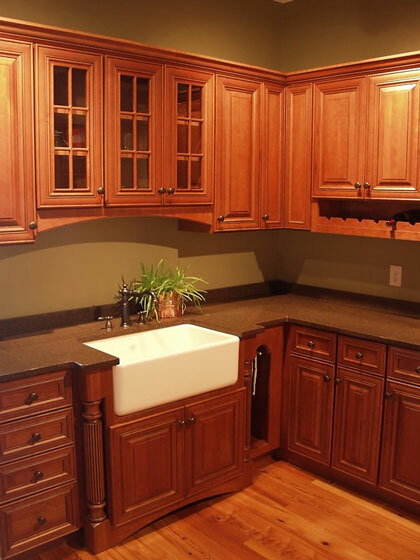 There are four basic types of kitchen cabinets: stock, semi-custom, and custom, as well as job-site built. Stock manufactured cabinets are mass produced, and are shipped either pre-assembled or ready-to-assemble. They are frequently available off-the-shelf at major home centers; they usually come in a limited range of standard styles and sizes, with a few finishing and accessory options. Stock kitchen cabinets are made in 3-inch width increments; their manufacturers generally offer matching spacers, or filler boards that are used to fill in gaps at the end of cabinet runs. Standard base cabinets are 34-1/2 inches high, whereas base cabinets designed for desks or eating surfaces are 28-1/2 inches high. Wall cabinets typically come in 30 inch, 36 inch, and 42 inch heights. Semi-custom cabinets offer better quality and a greater selection of features, styles, and finishes, but they cost more than stock cabinets and delivery lead times are longer. 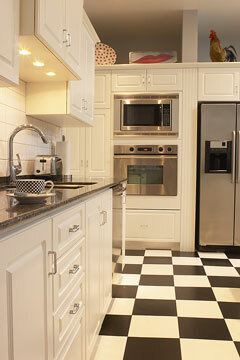 Semi-custom cabinets are also offered in 3-inch width increments, using filler strips as spacers. However, these cabinets are made to the homeowner's specifications, and they may include various interior organizers and other enhancements. Custom manufactured cabinets are built to your specifications. Here, you may select from a wide range of hardwoods, laminates, and veneers. At the high end, finishes are multi-step and hand-rubbed, with a baked-on conversion varnish finish. Heights, widths, and depths are all readily customizable to meet your exact specifications; design options are virtually unlimited. Sliding shelves, pull-out pantries, lazy susans, and appliance garages are just a few of the many storage features available. You can also expect to work with trained kitchen designers who will help you through the selection process. Traditionally, some kitchen cabinets were built at the job site by a carpenter or cabinetmaker. The woods typically used were medium hardwoods, such as birch or ash, rather than furniture grade woods such as oak, maple, or cherry. The style was usually selected by the homebuilder or general contractor. The final result depended on how well the cabinets were finished by the painter. Job site-built cabinets are still available today, but most kitchen cabinets are made in cabinet shops where specialized tools and clean finishing rooms are available. Kitchen cabinets should be of comparable quality to your furniture, so before choosing this alternative, consider whether the carpenter and painter are skilled cabinetmakers or furniture finishers. Kitchen cabinets are made with either face-frame or frameless construction methods. Face-frame cabinets have a frame that runs across the cabinet box face. The frame may show when the doors are closed. Most traditional style cabinets have a face frame. Doors may have recessed or raised panels, be trimmed, or have a framed glass panel. Frameless cabinets, or European style cabinets, are made without a face frame. Doors cover the entire front of the cabinet box. The doors are typically constructed without molding or trim, and the hinges are usually hidden. They present a contemporary look. Whichever cabinet type you select, choose fully-adjustable hinges so that the doors can be adjusted side to side, up and down, and in and out. Opt for full-extension drawer slides, which allow access to the full depth of the drawer. Some cabinets feature drawer-closing mechanisms that gently pull the drawers closed. Manufacturer of built-to-order kitchen cabinets and furniture. Offers fine custom cabinetry for kitchens, dens, and dining rooms. Superb value, great style, and the right solutions for your kitchen and bath budget. Smart, stylish cabinetry solutions to maximize your kitchen capabilities. Offers an impressive range of fine custom cabinetry for kitchens and baths. Manufacturer and distributor of popularly-priced kitchen cabinets and vanities. Cabinetry collections designed to complement your home's personality and your lifestyle. Quality kitchen cabinetry and bath cabinetry with time-honored craftsmanship. Original and stylish furniture for kitchens and other rooms throughout the home. Fully integrated manufacturer of fine semi-custom cabinetry. An array of cabinetry styles, finishes, options, and functional features. Cabinets with organization and style – for any room of your home. Kitchen cabinets with simple form, elegant design, and custom options. Cabinet Hardware - door knobs and hinges; drawer pulls and slides. Kitchen Cabinets - major appliances and small electrics. Kitchen Countertops - countertop design and materials. Kitchen Furniture - kitchen tables and chairs, islands and carts.